Free Chelsea Manning AGAIN! Free Chelsea Manning AGAIN! 14934 14 hours ago Anonymous Benllech, ot , GB This lady showed the crimes of her government and yet she is the one imprisoned. Not just a threat to democracy, but the end of democracy. 14925 5 days ago Raymond Nicholson Woodstock, GA , US I'm these troubling times were the Democrats and Hillary Clinton have committed such evil crimes locking Ms. Manning up for doing the right thing is beyond outrageous . Release Miss Manning now . 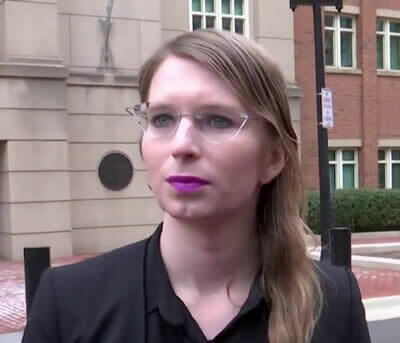 14924 6 days ago Amy Allard Woodstock, GA , US Chelsea Manning took an oath to protect the American people and that is exactly what she is doing. Release her immediately. 14923 6 days ago margie mcclure Portland, OR , US This is so Petty! and so Outrageous! Release Chelsea Immediately for daring to do what we have the Constitutional Right to so do! 14921 7 days ago Richard Stone Black Forest, AU What is all this really about? 14919 1 week ago Anonymous Palmdale, CA , US Chelsea Manning should be free! Where do we all meet? 14918 1 week ago Leo Elizabeth Alonzo Los Angeles, CA , US Get Her Out ASAP....Enough of this BS!!! 14917 1 week ago Sally Nelson Goldfield, IA , US Freedom of speech is Democracy!